The quilting group at the First Grace Brethren Church, a Charis Fellowship congregation in Grafton, W. Va. (Michael Willis, pastor), recently presented quilts they had made to four local service members. A report in the Mountain Statesman told about the special service. A portion of the story appears below. Click here for the complete article. The Quilts of Valor Recipients were Specialist E4 Jon Cochran US Army, Specialist E5 Brooke Russell US Army, Specialist E4 Viola C. Harris US Army and Petty Officer 1st Class David Lanham US Navy. 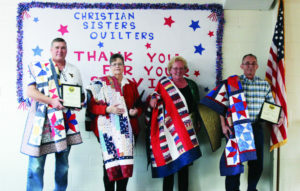 The Christian Sisters Quilters held their first annual Quilt of Valor Presentation on Sunday. The presentation was held at First Grace Brethren Church located in Grafton. Quilts of Valor is a non-profit foundation with the mission to cover service members and veterans touched by war with comforting and healing Quilts of Valor. The presentation began with a welcome from Pastor Michael Willis, followed by the Pledge of Allegiance and the National Anthem sung by Lakin Nose. He introduced the club members Carolyn Bee, Bobbie Bolyard, Jo Carder, Linda Coole, Diane Cox, Patty Cox, Patty Ford, Camilla Gawthrop, Sheryl Isner, Mary Radcliff, Alice Rogers, Anna Jane Shriver, Jane Trickett and Becky Willis.